We frequently meet with individuals operating at a grassroots level in an effort to learn about the current face of poverty. Earlier this summer, our staff sat down with three Alameda County employees to hear their stories. These employees work with Your Family Counts, a family support program for very low-income pregnant mothers and families with newborns. The program sends practitioners to the home to guide families through the parenting process and connect them to community services. The home visitor staff is multidisciplinary; they are community outreach workers, public nurses, infant feeding specialists, family counselors, and early childhood specialists. Needless to say, they are all well-equipped to provide a range of support to new parents. 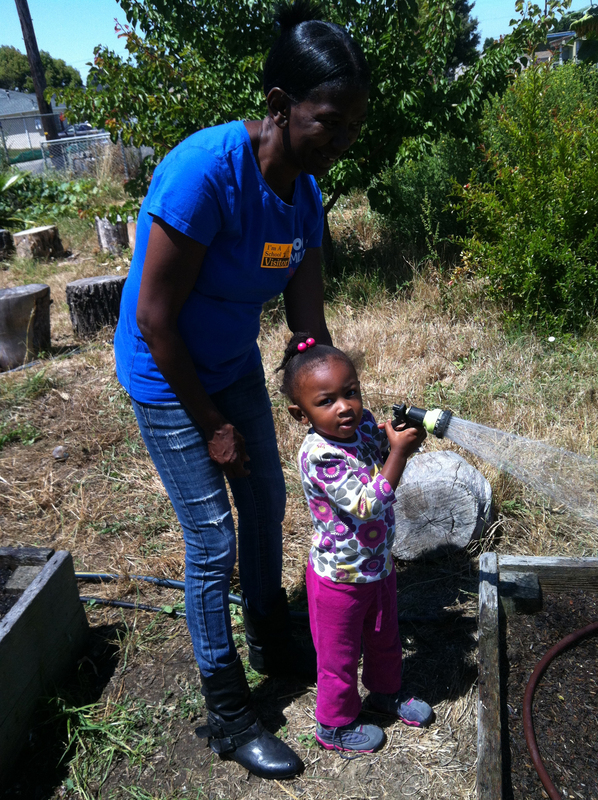 A mother and her daughter watering a garden as part of a project spearheaded by Your Family Counts. We asked the group of women, which was comprised of two public health nurses and one community outreach worker, what are your biggest challenges? The biggest challenge is that poverty is worse than ever before. One worker who has been doing home visits since 1985 said one used to be able to find a family member to connect young families with. Now there is less support within the community and many families are completely isolated. These home visitors may be the sole support system for homeless, teenage, or drug addicted mothers. Without a large support system to establish a nurturing environment, people remain tethered to the cycle of poverty. Mental health was also highlighted as a vital need for their clients; approximately half of the mothers and family members they work with are in need of mental health services, with little access to them. 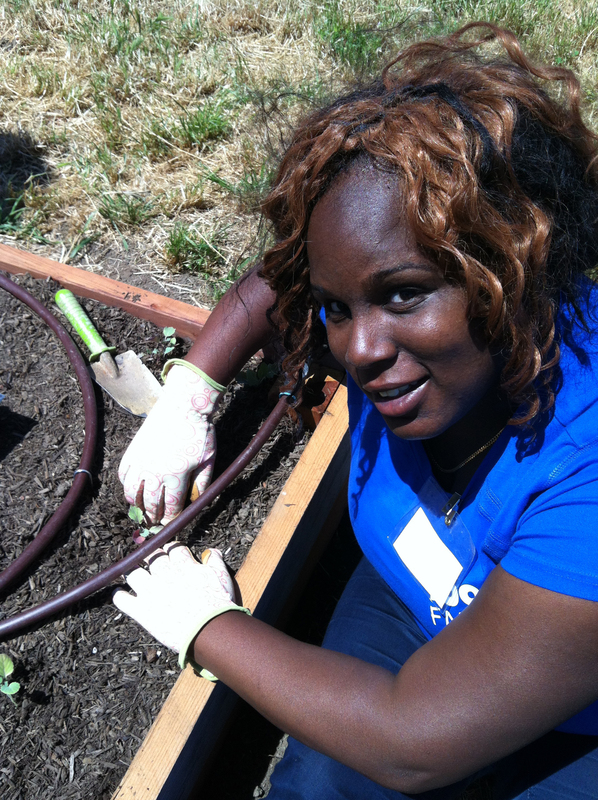 A young woman gains valuable gardening skills during the “Food to Family” training program. Despite this sobering news, the women assured us there are bright spots. There are critical intervention points that can help families that are marginalized: housing, daycare, transportation, and family planning. They marvel at their clients’ ability to keep moving, and they believe that when basic needs like these are taken care of, individuals can live healthier lives. We asked: what keeps your morale up? We learned that the home visitors have a lot of independence and can use their own discretion and creative ideas when faced with obstacles. For example, when one of the community outreach workers visited a family at a homeless shelter, the mom complained that the food being served was unhealthy. The family was unfortunately forced to eat this food, as the shelter received their food stamp allotment. To address this issue, she applied for a mini-grant of $2,200 which was used to conduct a 10-week session with moms from the shelter to empower them as “Food to Family Trainees.” These classes centered on wellness, gardening, and parenting, equipping the participants with the tools to become advocates within their community. 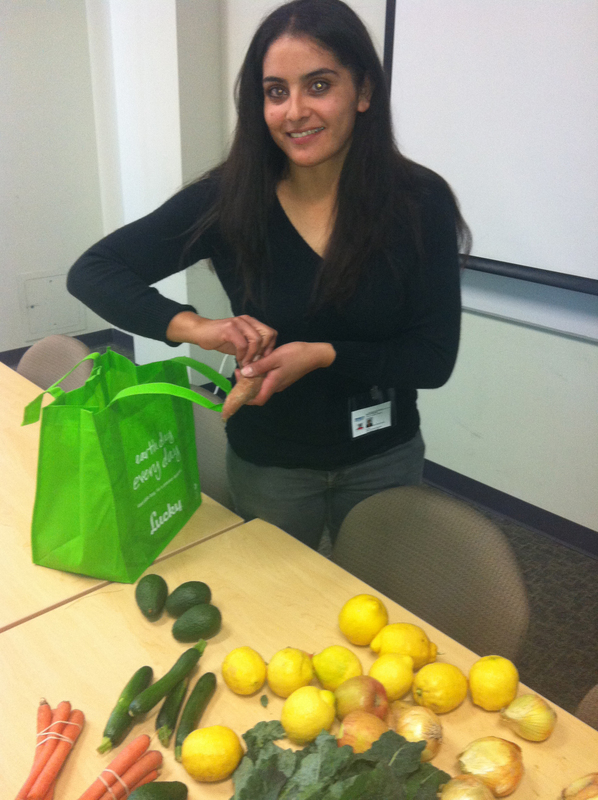 One of the “Food to Family” trainees advocates for healthy eating within her community. It is this kind of innovation that inspired us to grant these three women a $5,000 discretionary grant to establish projects like this. They told us how they constantly find themselves seeking discretionary money to tackle poverty more creatively. Rather than having to spend additional time writing grants, we wanted to allow them to focus on making an impact. Listening to these three women share their experiences was powerful; in spite of all of the hardship they have witnessed, they are optimistic and energized about tackling poverty from the ground up. These are the types of committed leaders we seek to support. This entry was posted in Uncategorized and tagged community, health, homelessness, leadership, poverty. Bookmark the permalink.